There is a suggestion to make post options orientation configurable. Some other blog clients have it vertical on the right side. How do you think post options should be oriented by default (for new users)? Also I remind that you can post polls from Semagic (in the links menu) and upload screenshots without use of external editor (by pasting clipboard contents with screenshot into Semagic) like I just did. Update: now you can use it, configure in Options/View. Then you can click on the post options header and drag it to the left. Note that this dragging will work correctly when the window is maximized. You forgot the option it doesn't matter, because it doesn't. As long as it's not cluttered and difficult to find what you need it's no big deal if it's to the right, to the left or as it is now. Icon! I remember seeing the leaflet for En Svensk Tiger one time when I was visiting Sweden. How difficult would it be to make where it goes a switchable option? I can see that it makes better use of widescreen real estate to be on the side, but I'm used to where I have things now. I like it on the side, but I wonder if it can't be made to eat a little less real-estate there (there's a lot of whitespace). while i have a widescreen monitor at home, i also have a netbook (10" diagonal screen) ... hence favoring the option (whether it's standard or i can attain it on my own) of having the posting options on the side. I like it the way it is now, but since so many people have wide screen monitors now, it probably makes sense to have the default for new users be on one side or the other. Given that widescreen is taking over the world, I would probably go for that. But I suppose you would have to be careful that this didn't make it look ridiculous on a netbook where screen space is limited. Is there any way of having the default setting autodetect based on screen resolution (ie, default = vertical for widescreen and default = horizontal for other aspect ratios)? Perhaps, choice possibility at program installation will be the decision? Just curious - but is there any likelihood (I expect not) of Semagic, or anything similar to it) appearing as an iPad app? It's certainly something I'd pay for. This is a great idea. configurable though so it can be top, bottom, left or right. That way whatever works for the individual is what they can have. One other thing that I'd really like to see is more supported music players. LJ supports Last.fm on their posting page, but Semagic doesn't and I'm sore about having to hand copy it if I want to post what's playing. Semagic has stopped posting to my blogspot (or blogspot has stopped accepting posts from my semagic) when I *post to multiple journals* (usually I just post to LJ but sometimes to both). It *appears* to post just fine, but it's not even showing up in my Drafts folder on blogspot... Have you any idea how I can fix this? Actually, it's been posting to a different blogspot that I co-author... (Major faux-pas!) Anyway to specify a default for posting to multiple journals? It seems to me that on the right - it is better. And on the wide monitor it will be more comfortably. The bottom arrangement can frighten off beginners with such monitors. To me it would be more convenient on the right. A Juumla reminds, and I from it work much. PS: Sorry for my clumsy English. Quick, non-related question: Even though I'm in the HTML editor and the option is set to "Create a href for pasted URLs", it doesn't make that. When I update this program I don't erase the previous version before it. Could this be why? This options processes URL clipboard format. When you copy to clipboard the particular program that you copy from puts the same data in clipboard in several formats. If for some reason it does not put it in URL format, only in plain text, the option will not work. 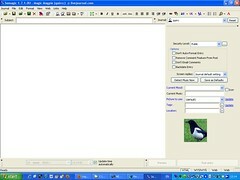 you can copy url and then press create link button in semagic (or ctrl+alt+L) so it will process text data. Good afternoon. Can I ask you a question? I am writing on LiveJournal with your program. Last week he wrote a note for three or four days. All the time saved as drafts her. Then he wrote a note to another, and drafts of the old notes were lost. Tell them you can somehow recover it? Semagic uses one default draft file, new content overwrite previous one. You should save it with separate filenames to have several drafts.